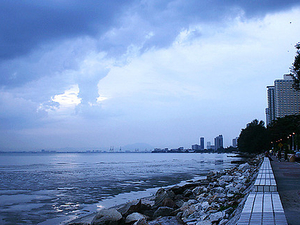 Teluk Kumbar is one of the district in Penang Island, located just between Bayan Lepas and Balik Pulau in Penang, Malaysia. The name Teluk comes from it location at a bay by the sea and Kumbar comes from a thorny palm type vegetation that grows wildly mostly on the inner hilly area. It was orally told by olds that during it was opened by some Achenese, the land is covered by kumbar clump and the name came from it. The palm, with it sour fruits, now is found rarely on the hilly area and it mostly cleared and replaced by durian orchards. Teluk Kumbar covers an area of about 10 square kilometer, an area with had a population of nearly 6000. It was divided to three main village, Sungai Batu, Teluk Kumbar and Gertak Sanggul. Teluk Kumbar, a historically a Malay fishing village, Teluk Kumbar was established in the 1880s, consist of main area as Kampung Masjid, Kampung Matahari Naik, Kampung Matahari Jatuh (Jalan Sepakat), Kampung Paya, Kampung Suluk, Kampung Pasir Belanda, Kampung Nelayan and Pekan. New small township named as Bandar Baru Teluk Kumbar is developed by PERDA (Penang Regional Development Authority) developed on a piece of land of padi field and rumbia swamp. This district shows its important role during British era as it produces rice, rubber, coconut and other raw and native products for a supply to locals and for export. During World War II and before Japanese occupation, British had built numbers of concrete fortress to defend this area from Japanese attack. The fortress can be seen at Kampung Nelayan near the mouth of the Teluk Kumbar river, and another one is located at the opposite of the main road in the front of Sekolah Kebangsaan Teluk Kumbar just beside the hardware store. Remains of Japanese warships also can be seen on the beach at Tanjung Ramai, Gertak Sanggul, showing that this area had witnessed a fiery sea battle between both powers, Japanese and Allied. 70% of its people are Malays, 25% are Chinese and 5% are Indian and others. A newly built mosque is under construction in Kampung Masjid, which will become a new landmark for Teluk Kumbar. The mosque, namely Masjid Maqbul Teluk Kumbar, can cater about 2000 prayers in a time. The process to build the new mosque was delayed for about 10 years because of a land title and state approval. The construction began on November 2012 and had yet to be completed a year later. The deputy prime minister, Datuk Seri Muhiyuddin Yassin, had made a launching for a groundbreaking ceremony on 9 March 2013 which officially marked the start of construction of the long-awaited mosque. 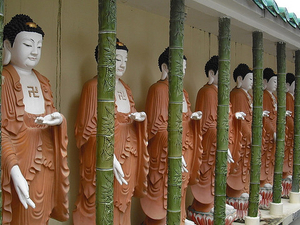 The main Buddhist temple can be found in Kampung Nelayan. It was a community centre commonly used by local people to meet, pray and annually presents a traditional show. 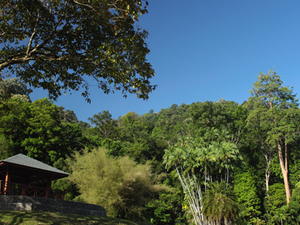 Hindu temple located on the foot of the hill to the north of Teluk Kumbar. 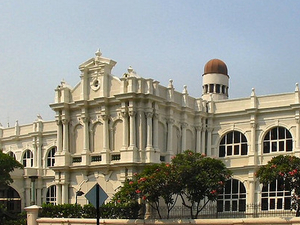 In the past, it was situated at a hairpin corner on the trunk road to Balik Pulau. Today, the road has been replaced by a newly completed bridge across a ravine, and the temple became hidden and only can be reached by a junction after the bridge. For public transport, RAPID Penang network serve 3 number of bus, 401, 401E and 301. Service available on every 30 minutes start from early morning till midnight 7 days a week. With RM4.00, one can take the bus from Ferry Terminal in Weld Quay, Georgetown and reach Teluk Kumbar within 45 minutes depend to the road and traffic condition. With a distance just about 4 kilometres, one can reach Penang International Airport in Bayan Lepas in a short time. 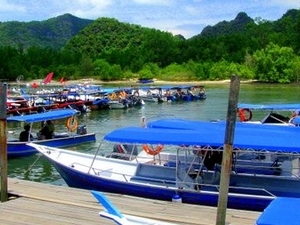 Teluk Kumbar is well known for its abundance of seafood establishments dotted along the beaches. 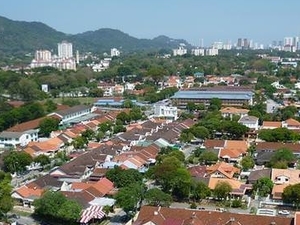 It is used to be a small fishing village, but due to proximity to Penang International Airport in Bayan Lepas as well as Bayan Lepas Free Trade Zone, the area now is composed of newly built housing estates to accommodate population influx. 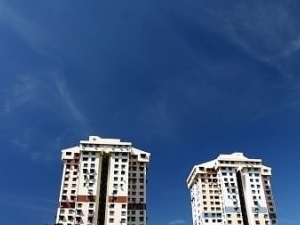 With the rapid urbanisation of Penang Island, and with the possibility of a second link bridge being built at nearby Batu Maung, Teluk Kumbar has seen some recent property development. Among these are the housing estates in Sungai Batu on the way to Teluk Kumbar. The main economic activities are fishing and farming. There were about a hundred of sampans, and fishing trawlers can be seen along the shore during dusk. The main catch is big white prawns that are used for delicious local prawn noodles, a spicy noodle dish cooked with big-sized prawns sold mostly at the Malay stalls, which becomes a main attraction. Food can be found in stalls operated by Malays along the road side starts from police station. It was a popular fare from Teluk Kumbar and available during lunch time. Teluk Kumbar also contribute a part production of seasonal fruits as durian, mangosteen, rambutan, langsat and others types of fruit that share a same delicious taste as popular Balik Pulau fruits. The main ingredients that makes the taste of this fruits different from the other states as Perak and Kedah is the salty sea breeze blowing from the nearest Indian Ocean. That makes the taste of durian here a little fatty and salty. The orchards mainly offer a variety if durian, mostly comes on their best varian of names. For those who like to eat durian kampung, many type of popular name of it can be found during it season. 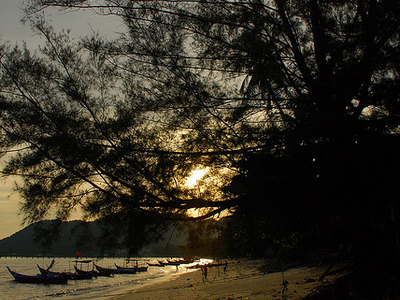 Teluk Kumbar also offers a good place for the anglers to try their luck along the beach line. 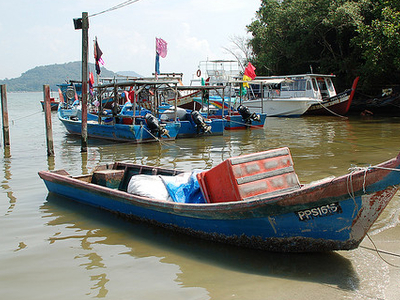 For about 10 kilometres, from Sungai Batu to Gertak Sanggul, anglers can find many fishing spot to attend their hobby. The main catch is sea-pearch, grouper and cat fish. Some part of the beach also rich with sea shell and can be collected during low tide. For those who love tracking or hill climbing, they can serve their hobby by the hill in the background of Teluk Kumbar. They can find a cement track which longs about few kilometres built by an durian farmers. From the peak of the hill, a beautiful panoramic view is the reward for their hard works. Teluk Kumbar has a popular beach known as Tanjung Assam. 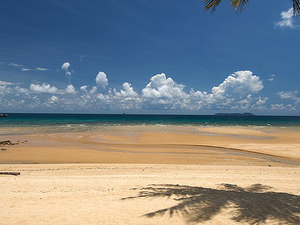 It has a nice beach with white sand and clear water almost the time of high tide. A few temporary stalls serve laksa, drinks and various type of fast food can be found nearby the beach. Beach goers also can rent a water sport goods from the stall operator at the seaside. Authorities also had built a panoramic view spot at the hill back of the beach and the best view there is during the sunset, when the golden sun slowly hides himself behind the horizon, leaving it golden curtain as a blanket for the coming darkness. For those who like to get sweaty, a desolate road mostly on Saturday and Sunday, from Kampung Sulup to Gertak Sanggul is a good place for joggers and cyclists to go down it for about 4 km.